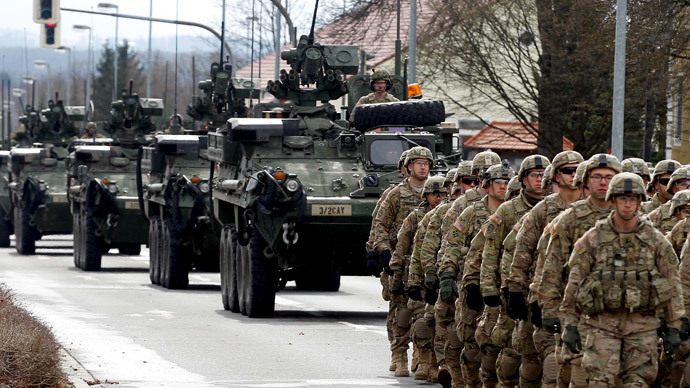 A US military convoy has completed its grand tour across Eastern Europe with over a hundred armored vehicles greeted by anti-war protesters at the gates of their base in the German city of Vilseck. Since March 21, around 120 vehicles, mainly Stryker AFVs – which took part in the Baltic drills near the Russian border – drove 1770 kilometers through Estonia, Lithuania, Poland, Latvia and the Czech Republic. The US military said that it was their longest road march across the territory of Europe since World War II. It has been more than just a road-show, with aircraft involved in the war games, circling above the convoy in the skies. US military commanders opted for a parade across the region instead of the more-traditional railway option, in order to show Washington’s support and commitment to its Eastern European allies. According to Lt. Gen. Ben Hodges, the US Army Europe commander, it was important for the American military to show that it “can move a lot of capability a long distance” after Russia relocated thousands of its troops during a massive domestic drill earlier in March. The exercise, entitled the ‘Dragoon Ride’ after the nickname of the involved US Army's 2nd Cavalry Regiment, saw the convoy stop in a new city every night, organizing different military-related activities for the locals in order to win their support. However, not everybody felt the party spirit along the way, saying that it’s uncomfortable seeing American armored vehicles rolling through their cities and towns. The convoy was also greeted by dozens of demonstrators as it returned to its German base on Wednesday. “We might be small in number here, but we represent many all over Germany, who want the soldiers the weapons, the tanks, from our land,” one of the protesters told RT. Head of the National Policy Institute, Richard Spencer, said that the ‘Dragoon Ride’ was a kind of “you’re welcome,” but not everyone in Eastern Europe was saying “thank you” to the US military. “I don’t doubt that many where quite sincere when they were waving the American flag or visiting with the American soldiers and things like that. And I think there were people, who were equally sincere in protesting this Dragoon Tour,”Spencer said. “I’d say that my sense of the mentality of the Europeans is a deep ambivalence about NATO and long standing semi-occupation, semi-alliance, semi security guarantee. I don’t think anyone really understands anymore. NATO was something that was born with the Cold War; it makes sense in the context of the Cold War. Does it make sense now?” he added. “But it was also an attempt to flex your muscles to Europe and say: ‘Look, we’re not going to call this an occupation. We’re going to call it an alliance. But we’re here to stay and you’re that we’re protecting you, but you ultimately don’t have a choice’,” Spenser stressed. On Monday, the procession was met by protests in Prague as scuffles between anti-war activists and people welcoming the US Army took place, leading to one man being arrested.